How does Winding Constrictor and Energy counters work? When Bristling Hydra enters the battlefield, you get symbol:esymbol:esymbol:e (three energy counters). Pay symbol:esymbol:esymbol:e: Put a +1/+1 counter on Bristling Hydra. It gains hexproof until end of turn. Well, satyr is not good enough to warrant an enchantment deck by itself. It is not the wincon you are looking for. 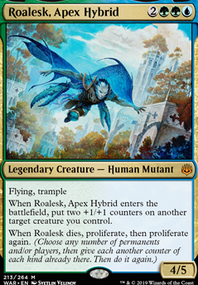 However, I think any hexproof creature is a big payoff towards that goal. Currently, Palladia-Mors, the Ruiner, Vine Mare, Carnage Tyrant and Bristling Hydra are the best targets for loading up with auras for an alpha strike. If you combine any of the above with Onward // Victory, it is an instant win (vine mare and hydra may require an +1/+0 from an aura). In short, no Satyr is not good enough. You need many other effects of the sort in order for an cnchantress deck to be born. I'd highly suggest adding in Cultivate, etc. for ramp; Inspiring Call for card draw and protection; Armorcraft Judge for card draw; Bristling Hydra nice body and makes a +1/+1 counter; Fairgrounds Trumpeter could get big easily; Retreat to Kazandu +1/+1 counters just for playing lands; Durable Handicraft for more +1/+1 counter generation; Abzan Battle Priest, Abzan Falconer, Ainok Bond-Kin, Tuskguard Captain, and Longshot Squad for great keywords; Regna, the Redeemer because you have a bunch of life-gain effects for her to make an army all on her own; and ways to close out the game like Overwhelming Stampede, etc. 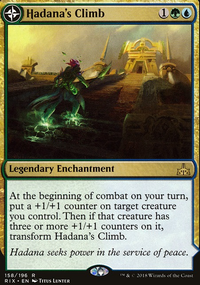 As for a few cuts: Danitha Capashen, Paragon does very little work with only 6 relevant spells; Resolute Archangel is expensive for her effect and has no synergy with +1/+1 counters; Surrak, the Hunt Caller I do not see haste for one creature being a huge deal, this seems to be a more slow build-up strategy; and cut it down to 36 lands plus ~10 sources of ramp (that is what I do at least). Fun looking budget build, good job! Yea, I don't know why I think Jade Guardian is so much worse then Bristling Hydra. It looks so plain, but it's a much better "Boggle" then the Hydra. I think its too board state dependent. We do need cards that are good on their own. 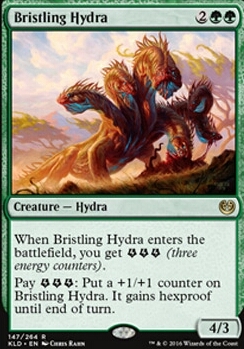 Well, we just want to replace Bristling Hydra with a card with built in hexproof that is either cheaper with almost the same power level or same cost with equal or greater power level in my opinion. Actually, i just need to replace Bristling Hydra post rotation with a creature that has hexproof and is cheaper to cast than Jade Guardian. Otherwise, i might go for Ripjaw Raptor in the main. 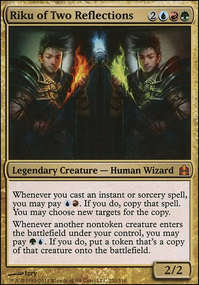 Regarding Thorn Lieutenant, i think the card stays in the deck regardless of what happens in the next set since a 2/3 body with replacement effect (if targetted), and a built in pump is great. I like the concept and the deck seems to be put together well. I do, however have a few thoughts that might add value to the deck. Bristling Hydra gets a 1-turn hexproof and has little synergy with the rest of your deck. If, however, you could equip Blanchwood Armor to one of your hexproof creatures, you get a powerful hexproof creature. You have mana ramp, but no added card draw. 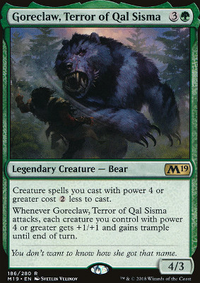 Rashmi, Eternities Crafter, Nissa, Steward of Elements and Colossal Majesty could all work with this deck, giving you some useful card advantage. 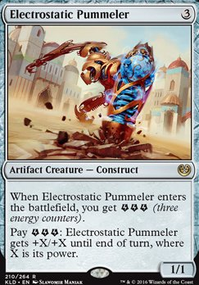 My preference would be to have at least a playset of something like Unwind (or Disallow) mainboard. They are actually 6 boggles and 4 conditionals Bristling Hydra and Rhonas the Indomitable. 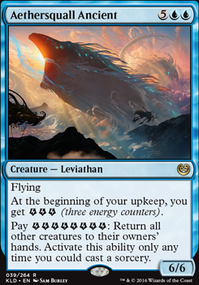 The other creatures are here for the extra damage and the opportunity to make them unblockable. Basically the "boggle theme" is sub-theme.